Martin Luther was the man that started the entire reformation by nailing his 95 Theses to the door of the Castle Church in Wittenberg, Germany. This document listed 95 errors that he discovered were being taught and confessed in the Roman Catholic Church. Here are the 5 Solas that came about due to the reformation. The Bible is the inherent, inspired word of God. From which we are to learn all that God desires for us to know. From this word we learn of our sin and the need for salvation. We discover how faithful God is as we study the Old Testament and we discover his mercy as he sends his Son to fulfill the promise of a savior in the New Testament. It is not a decision for Christ but God sending the Holy Spirit to work faith in our hearts as we hear the gospel that leads us to believe in Christ. It is hard for us in our sinful nature to realize that there is nothing we can do in and of ourselves to gain forgiveness and eternal life in heaven. It is only through what Christ has done for us that we have the hope that is within us of eternity in heaven. Once again it is by the Grace of God that we have been saved. We cannot do enough good deeds to earn our way into heaven. In fact no good is found in me apart from Christ Jesus. It is only because Jesus came to this earth and lived a perfect life in our place. Suffered and died on the cross at Calvary and rose again on the third day that we are able to be forgiven and the gates of heaven have been thrown open! Paul wrote these words and they are the epitome of what the 5 Solas point to. Everything we see is from God alone. And He should be given credit for all that he made. He alone provided a way out from our sin. We did not come up with it on our own. 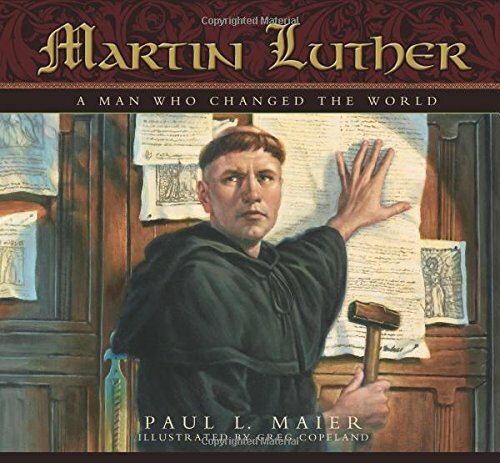 To learn more about the man Martin Luther I would like to recommend the book Martin Luther A Man Who Changed The World by Maul L Maier. Melissa writes at Life With the Suttons. She is a Home School mom who loves staying at home and teaching her child about the world around him and how God is in everything we say and do. Read the previous post: « Is Hygge Biblical for Christian Women? I must make one correction to my post. The church that Luther nailed his 95 Theses to was not in Worms but was Castle Church in Wittenberg, Germany. Thanks to my father for finding this error! I’m from Germany and my church is holding a special guest meeting for the Reformation. Hopefully many people will come and hear the Gospel! I must confess to being confused by 5 things that stand alone listed TOGETHER. I’m going to have to revisit this post later this evening when I have more time to ponder it 🙂 I’ll look forward to it. Blessings to you both, Melissa and Rosilind. That is wonderful! How did the service turn out? Thank you, Lori. Each stands alone because each stands for a different part of the faith – and yet together because together they make up the full foundation of the Christian faith. I hope that helps. Thank you for sharing! This is wonderful! 🙂 Thanks for linking up at Simply Helping Him last week 😉 Blessings! I keep these on my blog site at all times. Thank you for sharing them for others to read as well. Blessings. Thank you for stopping by to comment! Yes – these are so important to remember! An appropriate post today, remind us to do all for His glory! We are a homeschooling family as well, I will have to look for the book you mentioned. I think we may have read it when we studied the Reformation. We really like Louise Vernon’s biographies as well and Francis Shaeffer’s study was also quite helpful. Thank you for the other resource suggestions. Yes – all for the glory of God. This holiday is often forgotten – but it is so important to our Christian heritage.